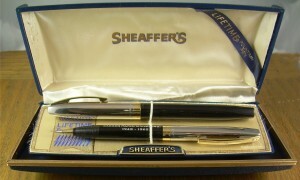 Maker: Sheaffer. For more general notes, see the page for the Imperial line. The primary difference between this pen and the Imperial IV (there was, as far as I can discover, no Imperial V) lies in the cap. Rather than plastic, is it all metal, the majority of which is stainless steel buffed to a mirror finish. Production Run: 1961 – 1973. Cost When New: $15.00 (for modern value, try this calculator). 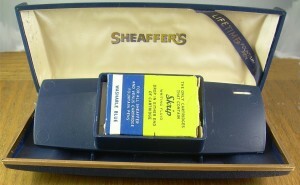 Size: 13.5 cm long capped, 14.3 cm posted, 11.9 cm uncapped. Filler: Touchdown, capacity approx. 0.7 ml. or cartridge, capacity approx. 1.1 ml. 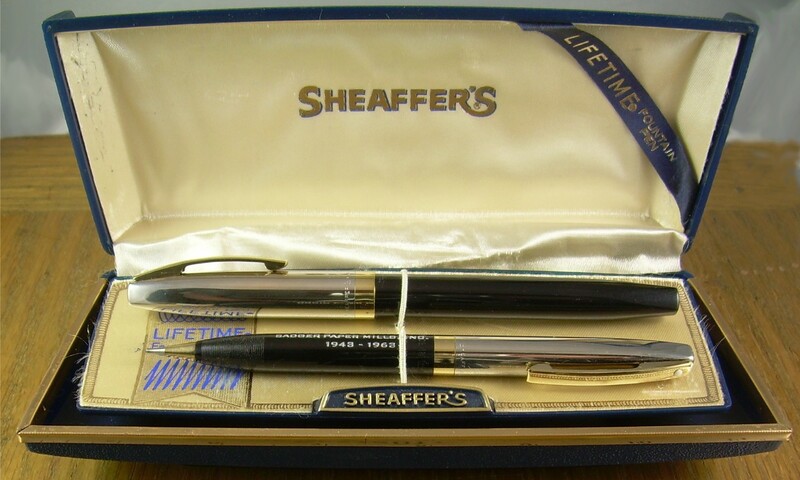 1500 Lifetime pen and pencil set. I’m reasonably sure that it comes from 1963, the first year for this style of marking. When I got this pen, it still had a sticker on the barrel which said “CARTRIDGE”, which gives a sense that a self-filling option might have been expected by the buyer. …and also on the cap; not just the clip, but also on the impression. I’m including several views of the case, as it’s unusually splendid. Under the pedestal, a supply of ink… but no leads for the pencil.